Activists involved in organising the recent wave of protests which have spread across Sudan since mid-June have been arrested and tortured by the regime, sources in the Sudanese opposition told MENA Solidarity Network this week. 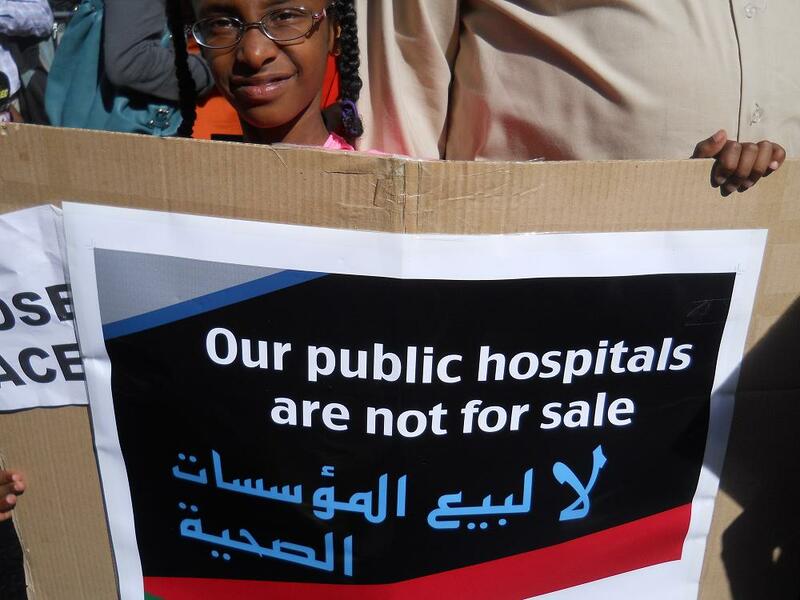 The regime of Omar al-Bashir has imposed sweeping cuts and privatisation schemes in a desperate attempt to deal with the financial crisis triggered by the separation of South Sudan last year and the loss of most of the Khartoum government’s oil revenues. Meanwhile up to a million refugees are trapped in the Nuba mountains and facing devastating shortages of food and medicine. The wave of protests across Sudan in recent weeks has sparked a brutal response from the authorities. Sudanese opposition activists told MENA Solidarity Network that up to 2,000 have been arrested and many tortured in detention. Among those detained and tortured include three members of the Sudanese Communist Party: Salah Samaret, a SCP party worker, Mohieldin Aljald, an engineer, and computer programmer Amira Osman. There is also rising concern over the fate of NGO activist Nahid Jabralla, who heads the women and children’s rights group SEEMA and was arrested on 3 July. Nahid suffers from a serious health condition and cannot walk unaided. Send a letter of protest to the Sudanese Embassy demanding that the Sudanese authorities immediately end mistreatment or torture of detainees and release all those arrested for exercising their right to peaceful protest. Please mention your concerns for the safety of Nahid Jabralla, Amira Osman, Salah Samaret, Mohieldin Aljald and all other detainees at risk of torture. If you are in the UK write to: Embassy of the Republic of the Sudan, 3 Cleveland Row, St James’s, London SW1A 1DD – or send a message via the embassy website here. Join local demonstrations and events in solidarity with the protests in Sudan organised by the Sudanese community in your country. July 11, 2012 in Campaign, Education, Regional, Sudan.